Two months out from the hike we decided we had better implement some sort of a exercise routine. Attempts to exercise seem to go two different ways. Way one involves a plan to exercise after Kyle gets off work, but then, when he gets home he’s pretty tired so instead we lounge in bed and work on this damn blog. Way two involves a surge of guilt about not exercising, leading to a huge over the top running-squatting-crunch-gut-busting-fest, resulting in extreme soreness and inability to move the next day. Despite these hurdles we found a great article in Backpackers Magazine that we have tried to adhere to. The article is by John Colver and he has some strategies for staying in great hiking shape at backpacker.com/motivate. Below is his basic training plan. Cardio Endurance: 30 mins of fast walking or running (at 50% of max HR) Body-weight strength training: 30 mins Cross-train: 30 mins of cardio (at 65% of max HR); stretch for 10 mins Rest Day: Stay active (go on a leisurely walk), but don’t stress joints/muscles Cardio endurance: 30 mins of fast walking or running (at 50% of max HR) Overall endurance: One day, do a long hike; rest on the other day. Kyle letting us know where he would REALLY like to be. At Paradise with the Cascades in the background. On the PCT near White Pass. 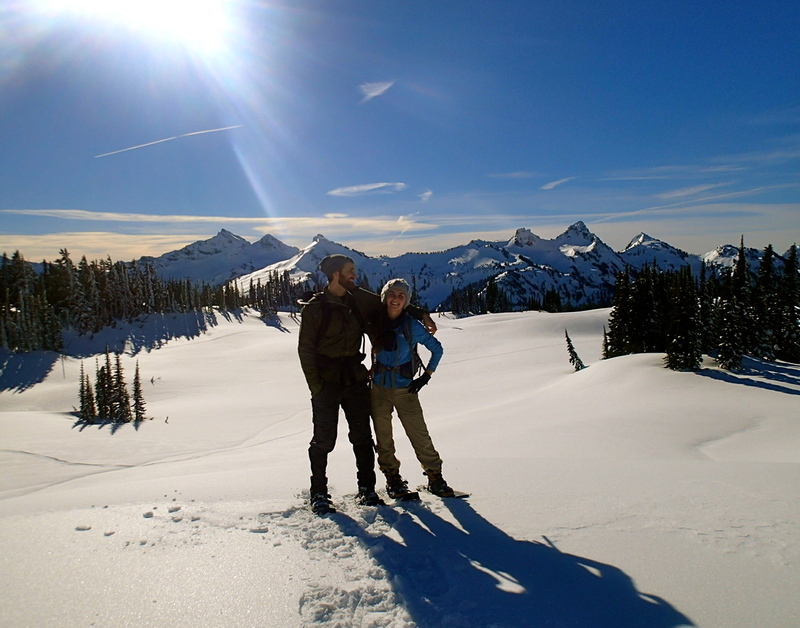 An amazing view of Mt Rainier from our snowshoeing hike at White Pass. Hiking in the Columbia River Gorge. Soaking in the Goldmyer Hotsprings after a nice long hike. Snow at the river gorge. Hiking up to Goldmyer Hotsprings. Hiking in the river gorge, saw a ton of waterfalls. *Disclaimer: We are pretty sure that no matter how in shape we try to be by the start of the AT the first month or so is going to kick our asses. Holy …. I’m moving from Chicago to the Pacific NW after the AT. Stunning! I’m planning on doing a thru-hike next year (14) and my workout schedule is actually fairly simple. I climb stairs for about an hour every other day (or maybe a bit longer), and that really burns up calories and strengthens leg climbing muscles. The other thing I do is swim every other other day to get super good cardio (if you stop swimming, you die!). Looks like you have a good schedule too though! I want go to Washington so bad.. Your pictures makes me jealous. Come to Washington! Its the best state, we just try to keep it a secret. Ha! I wish you guys good luck on your thru-hike. I’ll be here in the Smoky Mountains, may even be in the park when you make it to the Smokies!